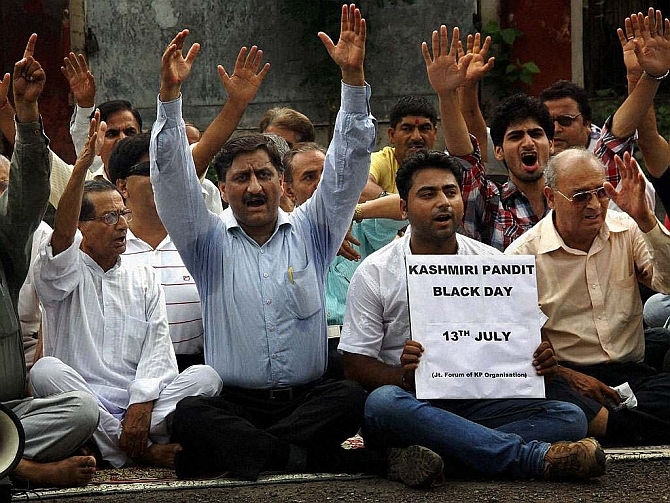 The displaced Kashmiri Pandit community recently staged a protest march at Jantar Mantar in New Delhi. Wearing black badges and bands, the Pandits accused successive state and central governments of marginalising the community since they were forced to move out of the Kashmir valley over 25 years ago. Their most recent grievance is that despite repeated assurances by the Bharatiya Janata Party and People's Democratic Party that they would be given proper representation in the newly formed state government, not a single member of the 300,000-strong Kashmiri Pandit community has been given a ministerial portfolio. As per official figures, there are about 79,000 registered Kashmiri migrant families in the country, of which around 60,000 families live in Jammu and 19,000 reside in Delhi. The Pandits believe their numbers are larger than what the statistics show. Prior to the 2014 Jammu and Kashmir assembly election, the BJP had promised to reserve three out of the 87 assembly seats for the displaced Pandit community. This commitment had been part of the BJP's vision document released before the election. The BJP would also reserve five seats for Pakistan occupied Kashmir refugees out of the 24 earmarked for them in the assembly and three for the displaced Kashmiris out of the 46 seats reserved for the Kashmir valley, Avinash Rai Khanna, who is the BJP's leader in charge of the state, had then said. The BJP also stressed it would provide better liveable conditions for the Pandits in exile in Jammu and elsewhere in the state until proper rehabilitation occurred. Mehbooba Mufti of the PDP was quoted by Rediff.com as saying she was determined to create favourable conditions so that the majority of Pandits could return to the Kashmir valley. During the Jammu and Kashmir election campaign, both Mehbooba and her father, PDP patron Mufti Mohammad Sayeed, had promised 'proper' representation for the Pandits in the ministry if the party was elected to power. Chief Minister Mufti Mohammad Sayeed has only created greater resentment within the Kashmiri Pandit community by steps he took after coming to power. Says Sangita Pandita, a school teacher in Jammu, "His earliest declaration on coming to power was that Pakistan and separatist militants had contributed to peaceful elections in the state. There was not a word of thanks to our community who had voted in large numbers for the PDP." The BJP-PDP government's decision to release separatist leader Masarat Alam from prison further upset the Pandits. The PDP may justify it on the grounds that Alam was a political prisoner and that the release of such prisoners was part of the common minimum programme agreed upon by the PDP-BJP, says one leader of the Pandit community, adding, "But for us it remains a frightening prospect and a grim reminder of the insensitivity shown by the government." Professor Hari Om, an adviser to the BJP in Jammu, believes the situation has come to this pass only because there is no unity in the Pandit community. "We are a divided lot," he says, "and that is why we continue to be side-stepped." "With some of the chief minister's statements, is there any likelihood that members of our community will want to return to the valley?" asks Professor Hari Om. "And since the central leadership has acquiesced, the chances that they (the BJP) will support us are very unlikely." Dr Sameer Kaul, a PDP spokesperson, is upset at the way five successive state governments have refused to deal with the Kashmiri Pandit community. Clarifying that he is speaking as a Kashmiri Pandit and not as a PDP spokesperson, Dr Kaul says, "It is a matter of regret that the BJP and PDP have refused to take the Pandits aboard in this government. The reason why we continue to be excluded is because politicians believe we are not a strong enough vote bank. We do not have the requisite numbers." "I must emphasise that in the last couple of state elections, candidates have won by a paper-thin majority. Some seats have been won by a few hundred votes and less. So obviously every vote counts and our vote counts a great deal," adds Dr Kaul. The Pandits, he says, have been living in the state for 5,000 years. "The Muslim community in the valley is a derivative of us and yet we have been sidelined." The BJP, Dr Kaul reveals, was on board on the decision to release Masarat Alam. "It was a deliberate ploy to sideline the Hurriyat and bring in a successor to (hardline separatist Syed Ali Shah) Geelani. The Hurriyat does not participate in elections, but it is they who decide which party comes to power." "Masarat Alam's release has changed the discourse in the valley. Legally speaking, there was no case against him," says Dr Kaul, presumably now speaking as a PDP spokesman, "but the aim of his release was to win the goodwill of the average Kashmiri." "The Indian political class accommodates communalism," says Jammu-based political analyst Dr Ajay Churungoo. "They have created a de facto communal state in the valley and the drift is only going to continue. The present government is following a policy of soft secessionism which is only going to erode the ideology of secularism further." The Pandits believe they can no longer impact state politics in a meaningful way. It is for this reason that members of Panun Kashmir demand a separate homeland in the Kashmir valley. "The time has come for us to be given a separate homeland," declares Dr Agnishekhar who has been promoting the idea of a separate homeland for the Kashmiri Pandits for many years. "For the last 600 years," he says, "we have been victims of Muslim majoritarianism. We will not accept being treated as second class citizens any more,"
"When we started moving out of the valley, Mufti Mohamed Sayeed was home minister at the Centre. Why did he do nothing to stop it? We don't want to live in the valley at the mercy of the majority community," he adds. Many Kashmiri Pandits in Jammu views Kashmiri Muslims with animosity. Muslims were once seen as 'brothers' with whom they shared a common language and cultural heritage. Now many Pandits feel the valley has lost the syncretic character they were so proud of. They feel "Kashmiriyat ab zinda nahin hai (Kashmiriyat is no longer alive). It has become Islamised." The Pandits show little desire to return to the valley even though some of them continue to own homes there. The central government has been trying -- with little success -- to create an enabling environment for them to return. Union Minister of State for Home Haribhai Parathibhai Chaudhary informed the Lok Sabha that despite the previous United Progressive Alliance government having announced a Rs 16 billion package in 2008 for the return of Kashmiri migrants, only one family had come back. Under this package, 5,242 two-room tenements were constructed in Jammu at four locations which had been allotted to migrants. Another 200 flats were constructed at Sheikhpora in Budgam district for the migrants on a sharing basis for those Pandits who joined state government service. 'Out of these 200 flats, 31 flats have also been allotted to the local migrants who have migrated from their native places to other places within the valley,' Chaudhary informed the Lok Sabha. Rediff.com met some of the 31 Kashmiri Pandit families who had moved into the four-storied apartments in Sheikhpora, built on what appears to be a no-man's territory with a sharply rising barren hill surrounding it on three sides. These apartments are guarded by the Border Security Force. The families moved in early March 2008. Their relief at finally finding a safe and comfortable haven is palpable. Many had been living in one-room tenements hired for them by the government following a series of Pandit massacres in Nadimarg, Wandhama and Sangrama. "We were made to sign a bond before moving in here. The bond states that this accommodation is available only for one year. Where do they expect us to go after that?" asks Rita Kaul, a school teacher. She met then chief minister Ghulam Nabi Azad to request him to allow these 31 families to shift to Sheikhpora. During the meeting, she warned him that if this was not done, the remaining 750 families in the valley would move en masse to Jammu. "Azadsaab immediately granted us permission to move here," she says, her dark brown eyes lighting up in triumph. Most of the Pandits who fled the valley in the late 1980s and early 1990s believed they would return a few months later. Not one of them anticipated that a quarter of a century later they would constitute the largest refugee group in the country.